We raise our beef strictly on grass only. 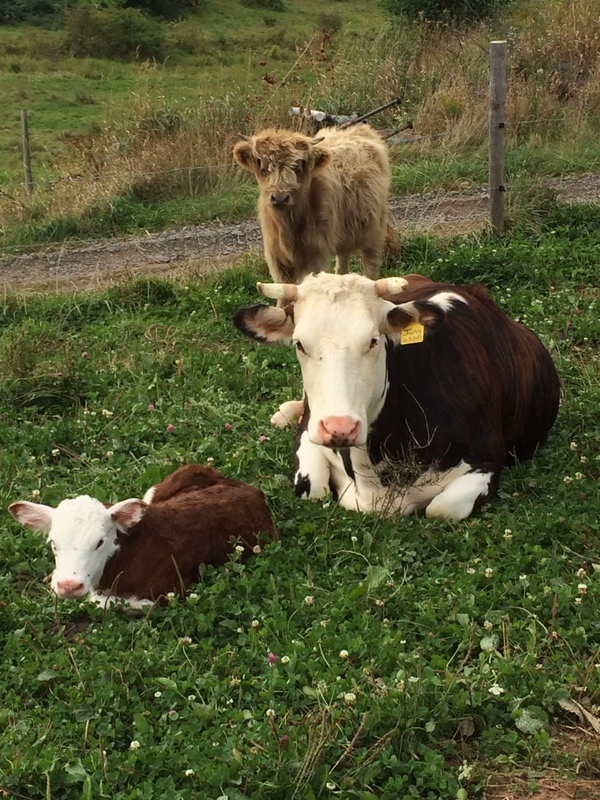 When they are calves they have mamma's milk until they are around 8 months old and they start eat pasture and hay during the first few days of life as well. Once they are weaned they still eat just pasture and hay until they are finished. We pasture our cattle from May to November and in the winter they are in the barn on a big bedding pack of straw. In the winter they just eat hay in the form of a big round bale. Our beef is antibiotic and hormone free. We raise our pigs in the woods where they get to root and dig and run around and fully express their natural behaviors in their natural environment. We buy them around 8 weeks old once they are weaned and we let them get used to the farm for a couple weeks before putting them outside. The piglets come from a farm that doesn't use gestation crates or sow stalls and when the piglets are born they don't clip their tails or teeth. They live in big pens on a bedded pack of straw. The sows are Yorkshire and Landrace crosses and the boar is a purebred Berkshire. Our pork is antibiotic and hormone free. The pigs have a grain ration from Purina feeds that is GMO free and by product free. Pigs are monogastric animals so they cannot survive on grass alone. That would be like us trying to live off of lettuce! 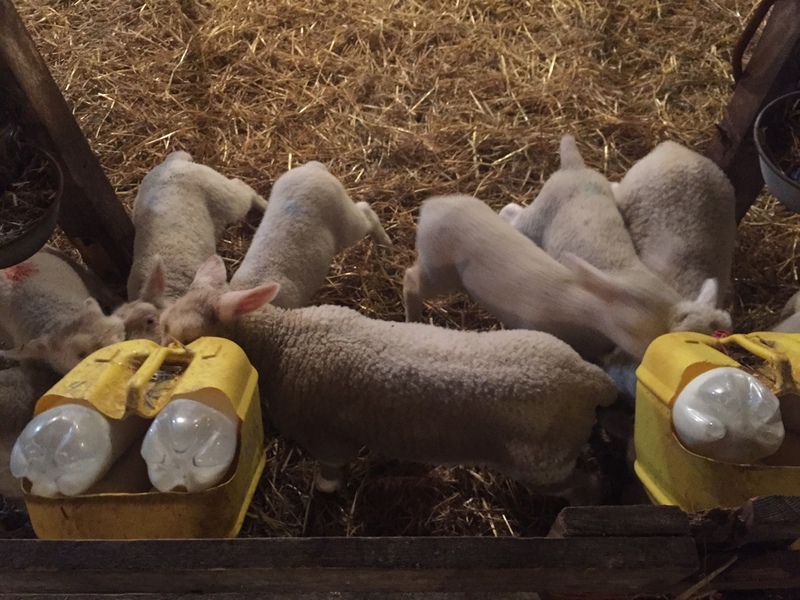 The lambs we buy are only fed hay and cows milk until weaned and as soon as the grass starts growing in May they are put on pasture to graze and spend the rest of their lives there eating a diet entirely consisting of the grass they graze. They are antibiotic and hormone free. We have a free range licence through the Chicken Farmers of Nova Scotia and we buy our chicks from a registered hatchery as day olds. They spend the first 4 weeks of life in the brooder. The brooder is a room in the barn that we heat because chickens need to be kept very warm and draft free for the first couple weeks until the grow out their feathers. They always have access to fresh water and feed. We do not use medicated feed for our chickens so they are antibiotic and hormone free. At 4 weeks old the chickens are moved outside into the moveable, floorless shelters which are sometimes referred to as chicken tractors. We move these shelters every day to keep the chickens clean and have access to grass. Chickens can't live on a grass diet only so they always have access to feed which is a grain ration. We have a free range licence to raise turkeys through the Turkeys Farmers of Nova Scotia. We buy the poults as day olds and raise them inside for 4-6 weeks. Then they go out on pasture 24/7 with a shelter. We give them a big area that is fenced and move them twice a week. They are antibiotic and hormone free. In the summer the hens are outside on pasture where we move them twice a week and then they go inside for the winter in the end of October. Their winter barn ensures them lots of space to run around and do their natural behaviors. We feed them GMO free feed. The hens enjoying the great outdoors.